What a mouthful that title seems to be? A perfect fit for this treat, you’ll be stuffing your mouth with this dessert in a classy way. Even though I try to keep our ovens off as much as possible in the hot weather, who are we kidding? Some of the best fruit desserts come from fresh Summer fruits, so we kinda have to turn the ovens on for them. 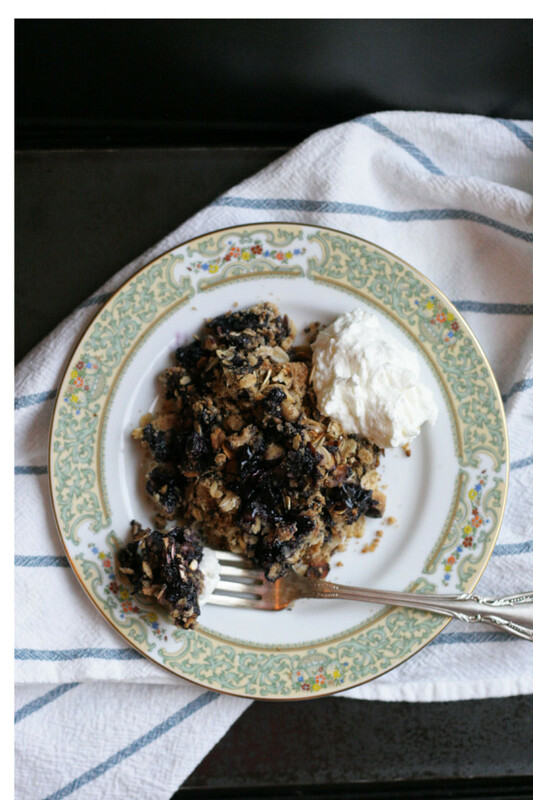 So do it early in the morning, no regret follows, especially when you take a bite of this blueberry peach crisp. Living in the Northwest, I topped it off with Oregon hazelnuts, and local oats. I went a little different on the whipped cream this time, and did a whipped goat cheese cream. Basically whipped cream with whipped goat cheese added to it, and yes it is so good! I love goat cheese and fruit together, they like each other a lot. As you have heard me say before, I eat a lot of fruit through the Summer. And with any of them, it is tough to make it to a dessert before I have eaten the fruit I bought. But I equally don’t feel I have done Summer any justice until I make a crisp using the beautiful bounty Summer has to offer. So my brother, brother in law, and I went berry picking to do Summer some justice. We ended up picking tons of berries to make this beauty. 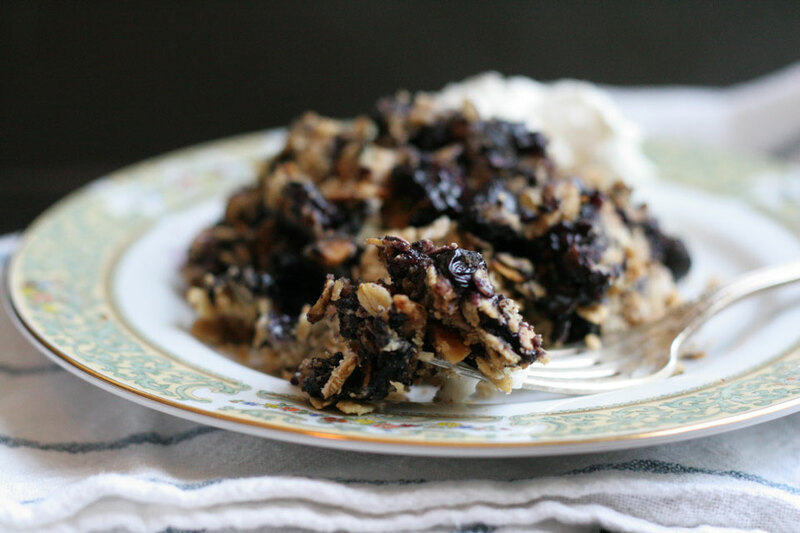 I have been travelling a ton for the blog and it’s nice to be home baking this dessert for my family and you! I hope you like it. If you don’t have blueberries, use any berries you have on hand or your favorite. 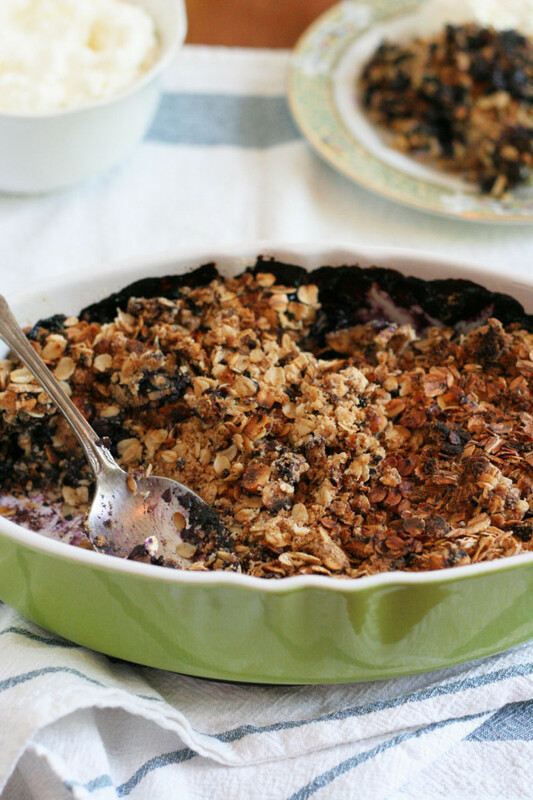 Do you love baking with fresh Summer fruit or just gorging on it? I’ll shared this recipe on Portland’s AM Northwest TV show. It’s always a good time on the show! Note: Taste the berries you are using. Adjust the sugar as needed. If the fruit is super sweet, use less sugar. Place rack in center of oven and preheat oven to 375 degrees. Butter an 8 inch baking pan. You can use a variety of them from pyrex, cast iron, pie tin, or pretty ceramic. Just pick one that is about 8 inches. 1. Combine the sugar, flour, and salt in the baking dish, whisk to combine. Add the berries and lemon juice to the flour/sugar mixture, mix to combine. 2. In a medium bowl combine the flour, oats, sugar, salt, and cinnamon, whisk to combine. Add the cold cubed butter, using your fingers, or a fork, rub the butter into the mixture to make a crumbly texture. Add the hazelnuts, mix to combine. Sprinkle evenly on top of the fruit. Place on a parchment lined baking sheet and place in oven and bake for 45 minutes or until golden brown. 3. While the crisp is baking, make the cream. In a stand mixer, or hand mixer with whisk attachment, or by hand using a whisk, whip the cream until stiff peaks. Place in a bowl, set aside. Add the goat cheese to same bowl, whip until smooth and creamy. Add the cream back to the goat cheese, and whip together for about 30 seconds, until combined. Note: You could skip the whipped goat cheese cream and go with old school scoop of vanilla ice cream, equally delicious! 4. Remove crisp from oven and allow to cool for 30 minutes before serving. Serve with a dollop of cream or scoop of ice cream. Store in covered in fridge for up to 3 days. If it lasts that long. You can also make this ahead of time, on the same day of serving, just store in fridge until baking time.